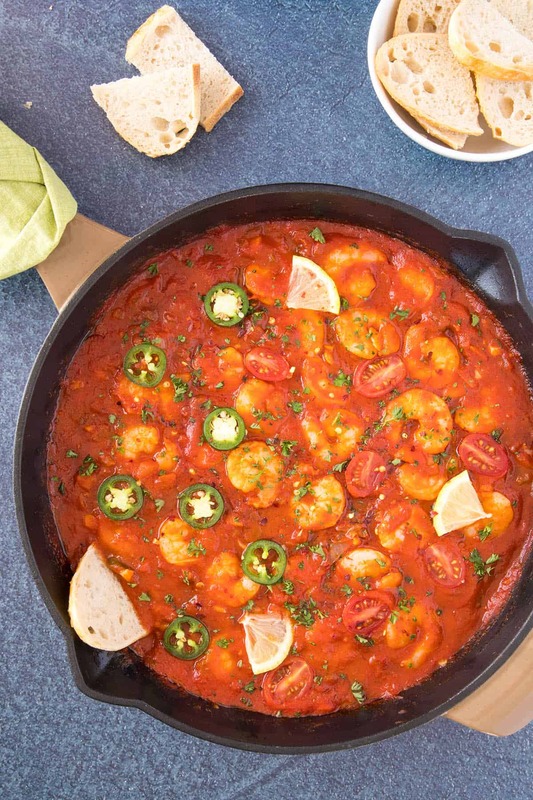 This Cajun shrimp recipe lightly cooks succulent shrimp in a simmering tomato sauce spiced with chili peppers, Cajun seasonings and more. Great for dinner or an appetizer. It’s time for some shrimp, my friends. 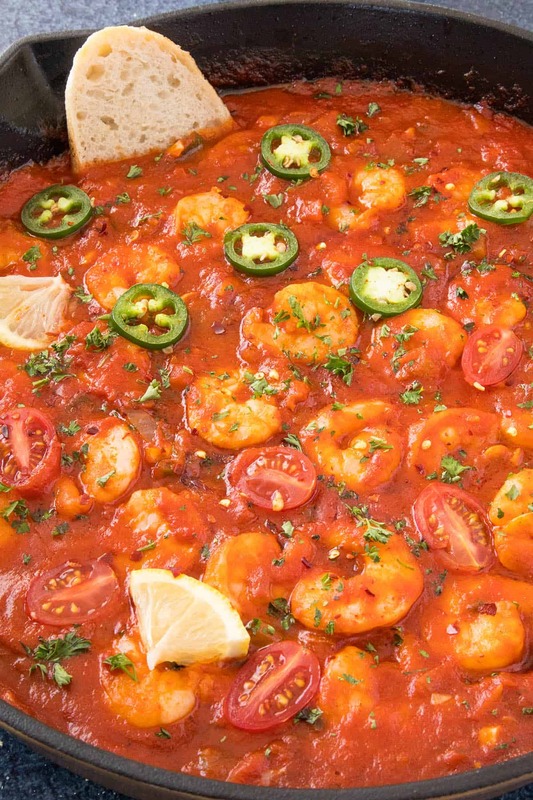 Spicy shrimp, that is. I’m always up for shrimp because it’s so much lighter in the calorie department than other proteins, but that doesn’t mean they’re boring when it comes to flavor. And! They take to my preferred spices so awesomely! A big hearty CHEERS to shrimp! Today I’m cooking these up in a nice and spicy tomato sauce that simmers with the Cajun Holy Trinity of onions, bell peppers (though I’m using jalapenos here for extra heat), and onions, along with a good portion of Cajun Seasonings and a few other ingredients that REALLY bring the FLAVOR. It’s great as either a dinner or to serve as a party appetizer, and I think you’re going to love it. Let’s talk about how we make it, shall we? It’s SUPER EASY. 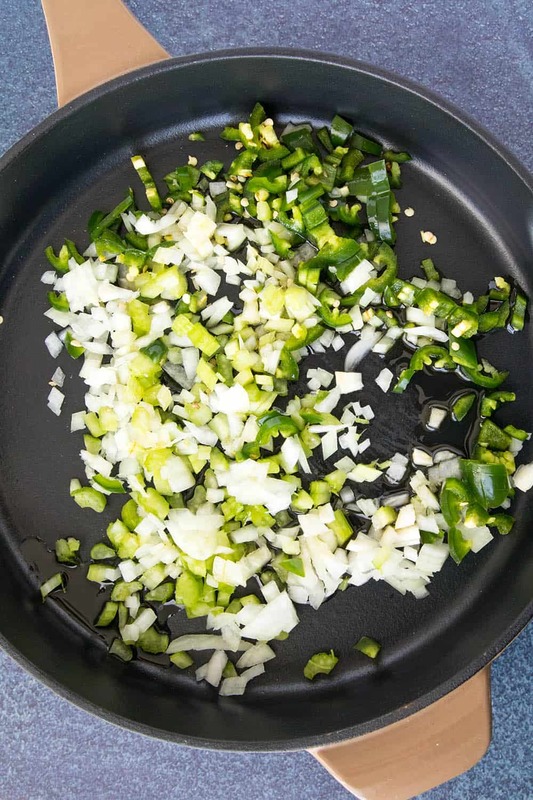 First, heat one tablespoon olive oil in a large skillet over medium high heat and cook down the peppers, onion and celery until softened, about 5 minutes. Next, add the garlic and cook another minute, until you can smell that gorgeous garlic. 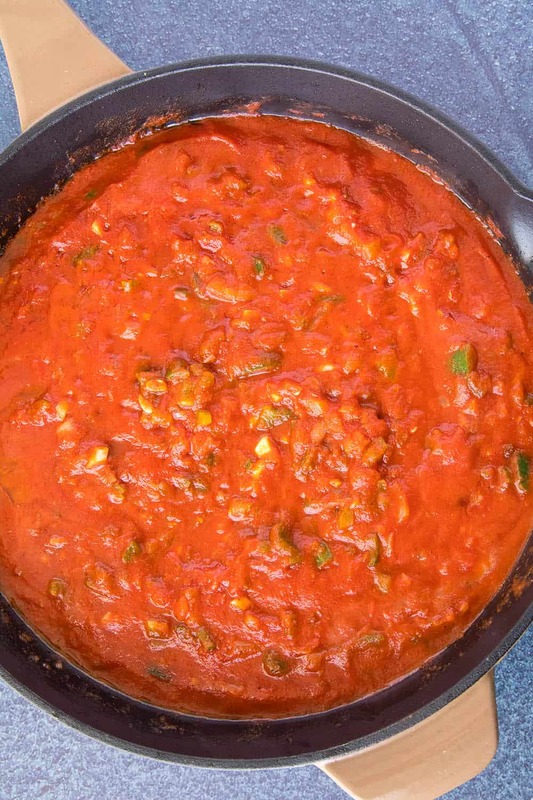 Stir in the butter, tomato sauce, Cajun seasonings, Worcestershire, vinegar, hot sauce and sweet chili sauce. Adjust with salt and pepper. Bring to a quick boil, then reduce heat and simmer for 20 minutes. You can simmer longer to develop more flavor. Add the shrimp and tuck them into the sauce. Simmer about 5 minutes to cook the shrimp, stirring here and there, or until the shrimp are cooked through. BOOM! DONE! 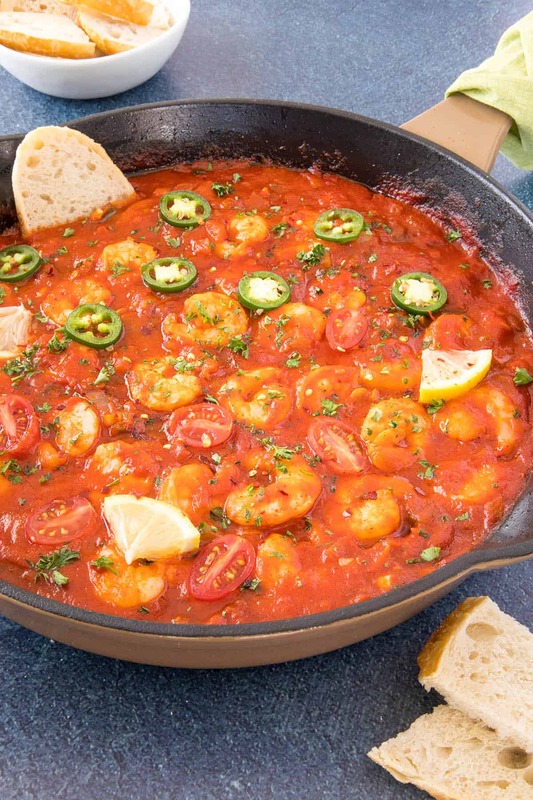 Easy Cajun cooking, right? I love easy. And spicy. 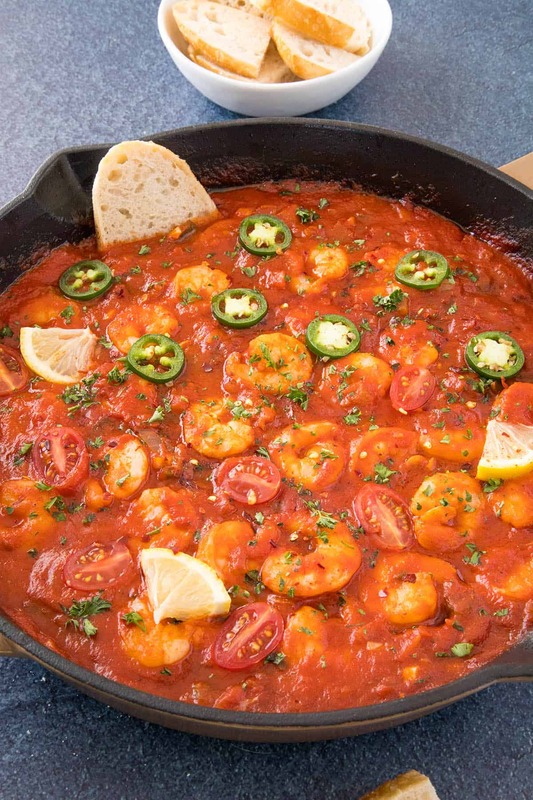 I like to serve my Cajun Shrimp with crusty bread to sop up all that wonderful spicy sauce. It works great as a quick dinner or party appetizer this way. It’s also delicious served over cheesy grits. Or, toss in some noodles to make a pasta version. The recipe works nicely served on tortillas, taco style, or over crusty French bread po’ boy style. I used jalapeno peppers here for a nice, easy level of spice and heat. You can dial down the heat factor by either coring out the jalapeno peppers or using bell peppers instead. Amp up the heat factor by incorporating more jalapenos or spicier peppers, such as the serrano pepper, or even a habanero pepper. Or, bring in more hot sauce or an extra blast of Cajun seasonings. Cayenne pepper is also a nice addition when seasoning. A good Cajun seasoning blend is my very favorite seasoning blend in the world. It’s my typical “go to” blend when cooking my every day meals. If you scroll through the recipes on this site, as well as thumb through the several cookbooks I’ve written, you’ll find “Cajun Seasonings” in the ingredients quite often. Talk about HUGE, easy Cajun flavor. Cajun seasonings are usually a blend of certain chili powders along with garlic, onion, salt and a potential slew of other ingredients. No two people make it exactly the same, though you WILL find many commonalities, which is why I love it so. Cajun seasoning originated with southern Cajun cooking, as the Cajuns would prepare a lot of game meat, including swamp critters that had some pretty tough flavor. They would highly season their food with bold ingredients, to make it more palatable. Check out my Homemade Cajun Seasoning Blend Here, along with instructions on how you can make your very own personal blend. That’s it, my friends! 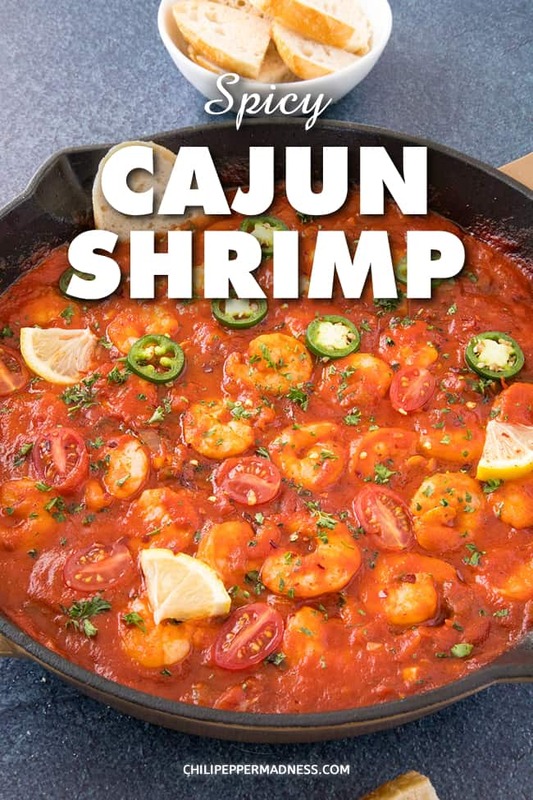 I hope you enjoy my Cajun shrimp recipe! I love it! Got any questions? Ask away! I’m happy to help. If you enjoy this recipe, I hope you’ll leave a comment with some STARS.Also, please share it on social media. Heat the oil in a large pan to medium heat and cook down the peppers, onion and celery until softened, about 5 minutes. Add the garlic and cook another minute, until you can smell that gorgeous garlic. Add the shrimp and cover them with the sauce. Simmer about 5 minutes, stirring here and there, or until the shrimp are cooked through. Heat Factor: Medium. You can easily up the heat factor with spicier peppers and hotter hot sauce choices. Check out my homemade Cajun seasoning blend. Or, use your own favorite store bought blend. Your pictures look like you used cherry tomatoes cut in half but your ingredients don’t show that. Did you used cherry/grape tomatoes cut in half? Jim, yes, I used those as more of a garnish. They are cherry tomatoes sliced in half. I’ll update the recipe notes on that.